Oh the joy of having nothing to do apart from sit and watch movies and stitch! I was contemplating doing some gardening (which I did not want to do as it was boring lawns) but it being a Bank Holiday weekend it has been pouring down along with thunder and lightning so I have the whole afternoon to do as I please! I am still working on the hand quilting of the throw, this will be a long job but a very pleasurable one. I decided to hand quilt some of the flower motifs from each of the patterned squares with metallic thread rather than just outlining the squares and it is looking really good. I am still not very confident with my machine skills for doing any other type of quilting – I look at Crazy Mom Quilts with envy. One of my targets for this winter (in my new craft room!) will be to get better at this.I think I will make some little art quilts for the walls to practise. My Summer Exchange piece has arrived at last in the USA so I can reveal it to you. This was organised once again through the Seasonal Exchange blog and was sent to Sarah who does not yet have a blog herself. Strawberries always remind me of summer so I stitched part of an Elizabethan knot garden design from a book I have had for a while, ‘Elizabethan Cross Stitch’ by Barbara Hammett. 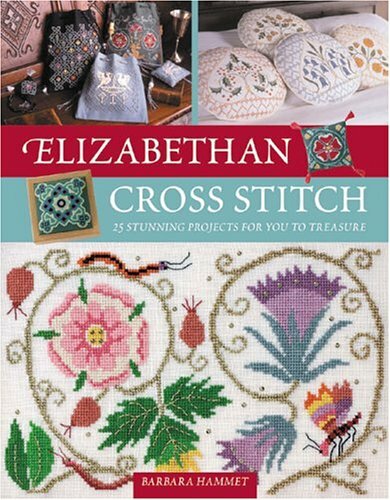 It is a beautiful book with loads of lovely designs. Once again it is stitched with Silk Mill threads. I made it into a pincushion with plain green evenweave for the backing and I have put a little strawberry charm from my stash on the back and a couple of beads from my Xmas ornie making stash on the front in the middle.The strawberries also have seed beads on them. Am off to see Ellie tomorrow so lots more stitching time on the train – what a lovely life!